Cherry Hill’s comprehensive collection of 101 Ground Training Exercises leads you and your horse through catching, yielding, turning, sacking out, backing, longeing, long lining, doing obstacle work, and much more. 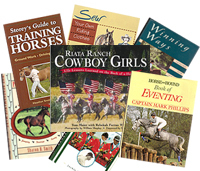 Every exercise is fully illustrated and described in easy-to-follow, step-by-step language that you can refer to during your ground training work — simply hang the book in the barn or on a fence post, and your’re ready to go! The exercises include clear goals, variations, common problems to watch out for, and lesson reviews. “Every moment you spend with your horse is an opportunity to instill good habits and develop his respect, trust, and willingness to work with you. All horses need a solid foundation of in-hand and guide-line training in order to be safe to handle and ride”.